Wild, guitar-driven rock music, The Black Crowes are known for their rock 'n' roll jams and Southern Rock attack on music lovers. Their latest release, A Tribute To A Work In Progress... 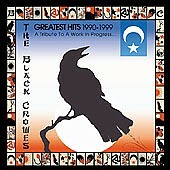 Greatest Hits 1990-1999 showcases a prolific near-decade of great rock music this band has created. From the Southern fried vocals to the roaring guitars and hammering rhythm section, The Black Crowes embrace rock 'n' roll and turn it into even more of a party than it was before. Jaunting keyboards help stretch the songs even more, adding a sparkling pop essence to this jarring rock numbers. I'll give it an A-.